Double Olympic gold medallist Max Whitlock says the Queen is a fan of gymnastics, after receiving an MBE at Buckingham Palace. The 24-year-old won Britain's first Olympic gymnastics gold medal at Rio 2016 on the floor, before adding a second on the pommel. "She told me she loved watching the gymnastics because the stuff that we do doesn't seem possible," said Whitlock. "It was pretty cool to hear the Queen say she likes the sport." 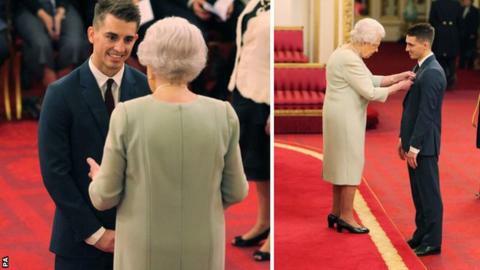 The Hemel Hempstead-born gymnast received his MBE from the Queen at an investiture ceremony at the Palace on Thursday. Reflecting on his success, he added: "It's been a really good journey, and the MBE actually tops it off." Meanwhile, Lauren Rowles who won gold in the double sculls at the 2016 Paralympics, and Daniel Brown, James Fox and Oliver James, who won gold as part of the mixed coxed four, were also appointed MBEs for services to rowing.